So after five days of travelling, four flights and endless hours spent waiting around in airports (including a couple of days spent with George's family friends in Abu Dhabi) we have finally landed in country number fifteen, India. Before we had even walked through to arrivals our bike box was there, ready and waiting. Phew! What a relief it was to see that tatty looking cardboard box sitting there on a trolley. Within 15 minutes or so, the bike was rebuilt and reborn and we'd gathered a bit of a crowd. Unfortunately, something was wrong. The front chainring/cog had been bent in transit and wasn't running true, meaning the chain came off with every revolution. After some rudimentary hammering and banging with inadequate tools for the job, we decided to walk the 2.4km to the hostel and tackle the problem in the morning. Not exactly the start we had hoped for in India! 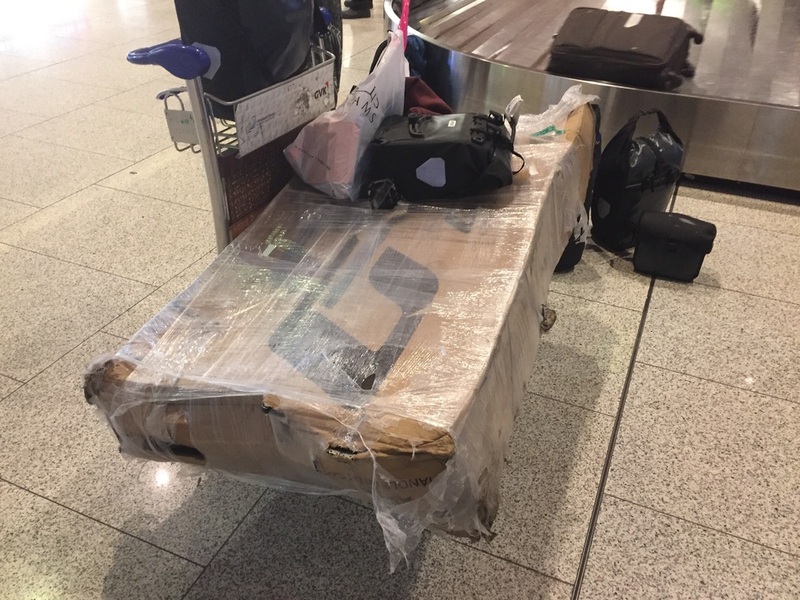 Our slightly battered bike box after 4 flights. Nothing quite prepares you for the assault on the senses that occurs when you arrive in this city. As soon as we stepped out of the airport one is instantly hit by the noise, the colour, the smell and the chaos. Every bit of road is filled with vehicles, from tuc-tucs to open sided buses and more taxis in one place than I've ever seen. Equally every bit of pavement is filled with people making or selling something, from fruit and veg sellers to vendors frying samosas or cooking up sev puri, every bit of space is utilised. The walk from the airport to the hostel was slow because of how incredibly busy all the streets and roads are but it gave us a wonderful taste of Mumbai. After checking in and a quick change of clothes we headed out to find some food. 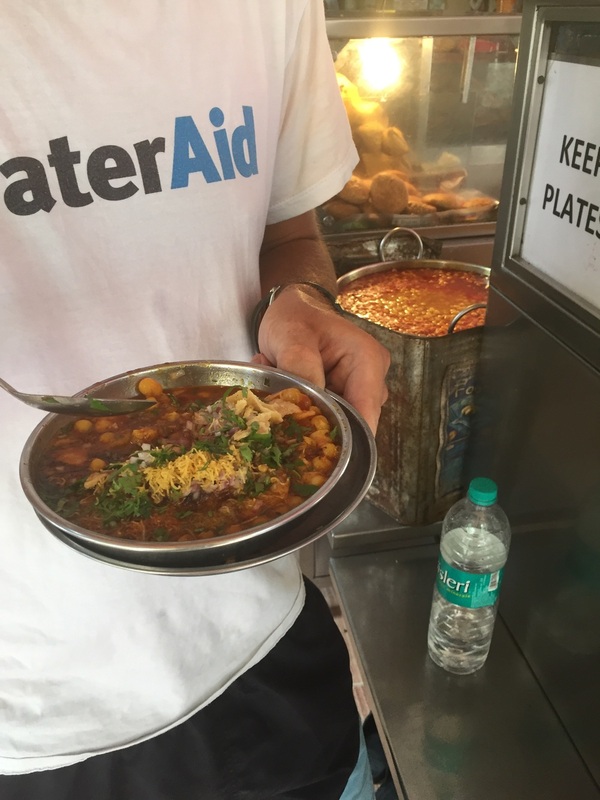 We've been told one of the specialities of Mumbai is pav bhaji, a thick vegetable curry of sorts usually served with butter and a bread roll. The guy running the hostel recommended somewhere and it did not disappoint. Washed down with a couple of glasses of lassi, we were very happy bunnies and ready for some shut-eye. 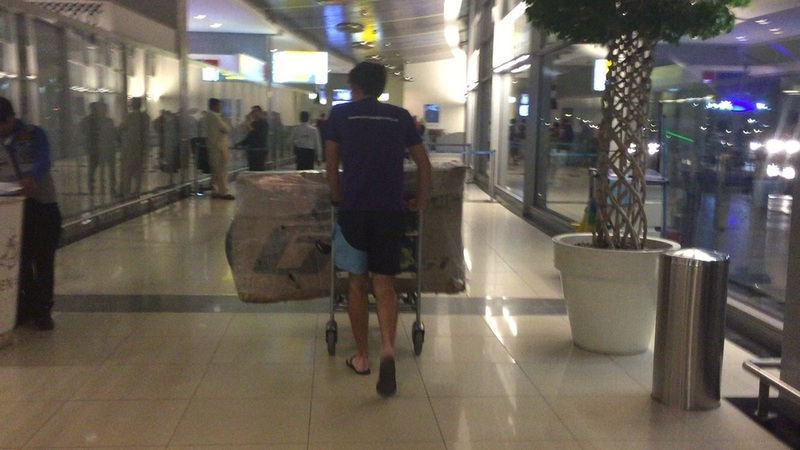 It was now over 30 hours since we had left Abu Dhabi, with not a lot of sleep in that time. India truly is one of the homes of street food. The next morning I go in search of a cash point only to realise that the streets around where we were staying must have been quiet the night before! It was a new level of madness. More food and drink vendors had popped up, the roads were even busier, it took me nearly 20 minutes just to cross the road! After breakfast (a sort of chickpea dal with potato cakes and lots of chilli), we tinkered with the bike and got it back to a rideable state. We then headed to the south of the city to do some sightseeing, leaving the bike we took public transport, which was an experience in itself. Anyone who has ever complained about commuting in London should come here and try these trains! They are so tightly packed with people, we worked out, that unless you jump off the train whilst it is still moving, you're never getting off because of the amount of people who push their way on at each stop. It's a difficult system to get used to as we missed our stop the first time because of it! We spent the evening planning our route out of the city and the coming few days. We are now going to be cycling south towards Goa, following the coast and down to the southern tip in about 10-12 days time. 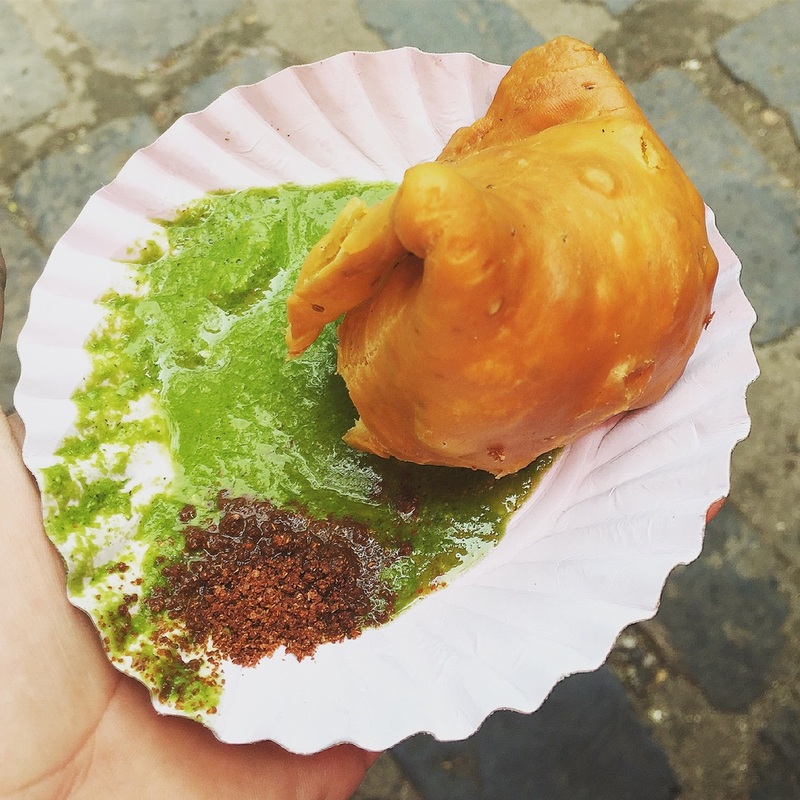 Vegetable samosas by the side of the road with a mint and coriander chutney. Mumbai has been an incredible introduction to India and we cannot wait to see what the rest of the country has in store for us. Keep following and sending us your support! It really does keep us going!